A bed table (sometimes written as bedtable) is a valuable and practical piece of furniture, which can help make your life a lot easier. They are especially useful for those with special needs, medical needs, or who are bed-restricted with limited mobility. 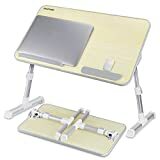 However, they can be useful to almost anyone, depending on your intended use of the bed table. With a bed table, you can more easily work on a laptop, eat, read, and do crossword puzzles, color, and much more while in bed. 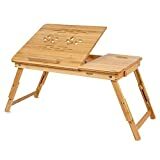 What is a Bed Table? A bed table can take many different forms, and be made from a wealth of different materials, with different featured and functions depending on their intended use. Some are designed to be permanently attached to a bed with a swing arm or other adjustable connection. Others are fully self-contained and are simply placed on the bed and removed when not in use. Still, others are fully integrated into the bed itself – this is most common in medical settings. These may be called in bed tables in some cases. Bed tables can be made from wood, composite, plastic, metal, or a mix of materials. Most often, institutional examples are more durable and easy-to-clean, like plastic whereas those designed for in-home use are more fashionable. They are often made from composites like fiberboard with plastic or non-porous laminate surface. The tables themselves can be designed for various uses, and the functions often dictate some of the form and design. 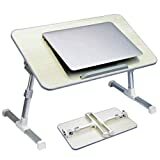 Laptop bed tables, for example, are obviously geared toward allowing adjustable, easy use and support of a laptop computer. 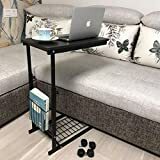 Portable bed tables are often more akin to food trays with self-supporting legs. Overbed tables, that either swing into place or slide over the bed, are much larger and more robust, and can provide a large, durable surface for those who are bed-ridden to work off. It’s important to note that these are all separate from a typical bedside table, more often called a nightstand. Bed tables are specifically meant to be used in the bed, and provide a function in the bed, whereas night stands are out-of-bed items of furniture for the placement of a lamp, clock, glasses, a phone, book, and similar items, to access them from within the bed. They are similar, but have distinctly different purposes, designs, and uses. In addition to some availability from furniture stores and typical furniture retailers, the greatest range of bed tables is usually found online. There are several online furniture and home furnishing sites that provide consumers with access to affordable, high-quality bed table options, as we outline below. 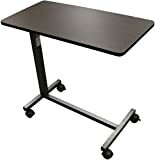 Note that institutional customers may or may not be able to find what they are looking for from these sources – highlight specialized institutional versions of bed tables are often supplied to hospitals and similar through specialty equipment suppliers and catalog companies. Wayfair offers competitive pricing, excellent shipping policies, and a massive selection of furniture and household items. Home furnishings are their entire business, so you can rest assured you’re getting good quality items from reputable manufacturers. 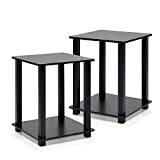 Amazon has pretty much every kind of item you can imagine, so it’s no surprise that you can find several different styles and grades of bed tables here. The prices range from quite reasonable to fairly exorbitant, depending on what kind of bed table you are looking for. But, as always, excellent customer service, existing shipping discounts for Prime members, and similar benefits mean Amazon is a great place to look. Many people think of eBay as only a source of used merchandise, autographed memorabilia, and collectibles, but that’s only part of the story. eBay offers a full marketplace of items, many brand new. You can often find overstock or clearance items from major manufacturers, available for a fraction of the original retail price. Walmart, the retail juggernaut, has continued to grow their online offerings to compete with the likes of Amazon. Their extensive network of suppliers means they can offer not only items they stock in store themselves but also merchant partners who provide additional offerings and augment the items that Walmart stocks. And, since it’s Walmart, the prices are almost always fairly low and reasonable, even on bed tables. Swedish-based furniture giant IKEA is also a great place to look for bed tables. They have a little bit of everything in their range of uniquely-named, self-assembly furniture store, and that selection is fully available online. Prices tend to be a bit higher, but you can often find things there that you can’t find at any other online retailer. What Should You Look For in a Bed Table? The main traits that you should look for in a bed table are going to depend on your intended use of the product. For example, bed tables that are going to take a lot of use need to be extremely durable and easy to clean. 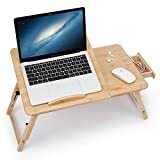 If the primary goal is to have a laptop bed table, you’ll want to ensure it has adjustments and features to corral your cords, provide the right angle for you to use the laptop, and so on. Naturally, you’ll want to have one that fits with your bed setup and adjusts to the right heights and angles for you. And, like any purchase, you want to ensure the product is from a reputable manufacturer and a trusted brand that stands behind their products so that it will last over time. Other features like storage, built-in wrist rest, and similar are always worth considering, too. What Should You Consider When Buying a Bed Table? You’ll want to ensure it fits your bed, the intended user, and is adjustable to be comfortable and versatile for the intended use purposes. 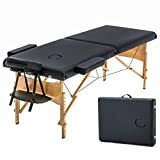 Many bed tables allow for significant adjustment so that they can be used while both sitting up in bed and laying down. Depending on your intended use, the tilt range, adjustment angles, and other actuating features are critical parts of buying a bed table. This dictates the design, size, shape, and features aspects of the bed table you are looking to purchase. 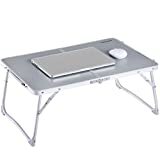 If it’s a laptop bed table, for example, you will likely be looking at very different examples than if it’s designed as a meal table for someone who is permanently bed-ridden. You’ll want to ensure it meets the needs of intended use but does so in a way that is easy and straightforward for the user and/or caregivers. 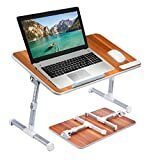 If it’s intended as a laptop bed table, it needs to have all the functional elements to make it usable for a laptop bed table. The features and functions should flow from the intended use and design of the bed table. Provide valuable functional help for those with limited mobility who spend a lot of time in bed. Can make it easier to work, eat, and be entertained in bed. Often serve as essential surfaces for those in medical settings. May cost a lot of money. Can be large and obtrusive when not in use. May be difficult to adjust or put in place, especially for older or weaker patients, requiring the help of a caregiver. In some cases, they may discourage recovery and being active/getting out of bed. 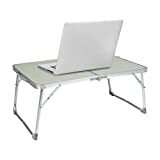 In general, bed tables are a great accessibility aid, that can help those who want to get work done in bed, or who have no choice but to eat, work, and entertain themselves in bed due to medical conditions or restricted mobility. Whatever the case may be, bed tables are available in different styles, materials, and intended functions, for both home and institutional settings. Their features vary based on their intended use, and a wide range of styles are available from some of the top online furniture retailers. With a little planning and research, you can find an excellent bed table to suit your needs.